Long Stay: Rent or Buy? Expat research indicates that roughly 30% of expats are living in housing similar to their native country. There is a correlation between several factors, such as pricing, local experiences, proximity to work/city centre and neighbourhood conditions. In the Netherlands, there is an ongoing political discussion regarding mortgage matters. 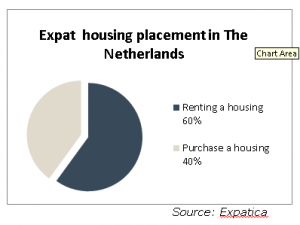 British expats are advised to buy a house only if they will be residing in the Netherlands for at least for three years. The idea is to improve the recovery of start-up costs involved in purchasing a property, which is approximately 6% of the total price. In the long term, if you would like purchase a house in the Netherlands, please consider the increase in interest rates. This could make the recovery last longer. Take a look at the type of mortgages available in the Netherlands here. If you are planning to stay for just a couple of years, renting would be your best option. Contract costs are fixed, repairs and maintenance are usually the responsibility of the landlord and the termination of the contract is often flexible, in case you need to move home or to a new city.